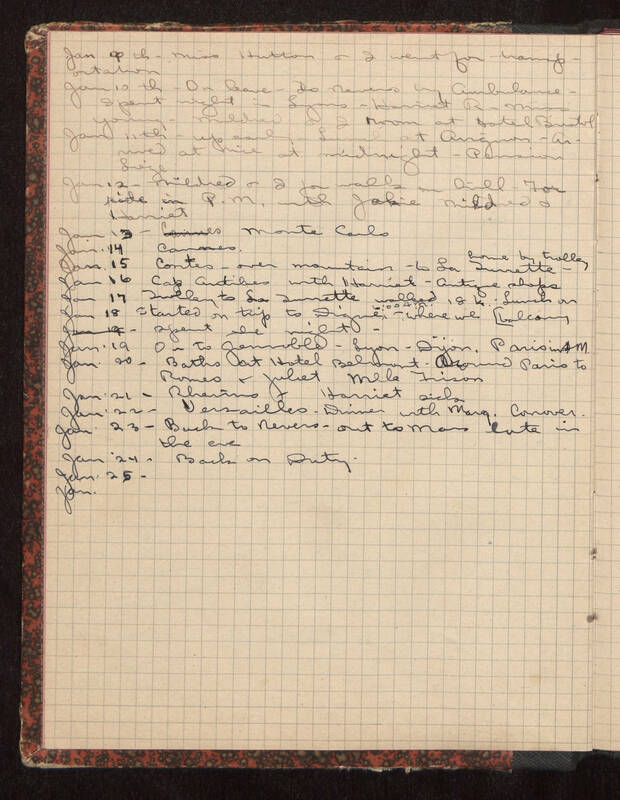 Jan 9th - Miss Hutton & I went for tramp [illegible] Jan 10th - On leave - To Nevers by ambulance - spent night in Lyons - Harriet R. - Miss Young- Mildred & I room at Hotel Bristol Jan 11th - Up early Lunch at Arrignon-Arrived at Nice at midnight - Pension Liege Jan 12 - Mildred & I for walk on hill - for ride in P.M. with Jakie, Mildred & Harriet Jan 13 - Monte Carlo Jan 14 Cannes Jan 15- Contes- over mountain to La Tourette home by trolley Jan 16- Cap Antilies with Harriet- antique shops Jan 17- Trolley to La Tourrette walked 18k. Lunch on balcony Jan 18- Started on trip to Digne 6:00 a.m. - where we spent the night Jan 19- On to gennoble - Lyon- Dijon. Paris in AM Jan 20- Baths at Hotel Belmont. Around Paris to Romeo & Juliet Mela Frison Jan 21- Rheims - Harriet sick Jan 22- Versailles- Dinner with Marg. Conover Jan 23- Back to Nevers- out to Mars late in the eve Jan 24- Back on Duty Jan 25- Jan.